A series of unexpected and seemingly unrelated events (including encouragement from great volunteers, a last minute field trip venue change, perfect burn weather one fine spring day, a drenching downpour & flooded creek one late spring day, a new fire management partnership, etc...) conspired to produce spectacular results. In mid-May we held a field trip for members of the Friends of Plant Conservation (http://www.ncplantfriends.org). Guests and leaders alike were impressed with the results of a spring-time prescribed burn. Photo opportunities abounded (see image, left). There is nothing like seeing freshly sprouting plants invigorated after a burn! While most people were snapping photos, some on their hands & knees, Lesley Starke called me over. She pointed to the small, hairy shrub (pictured above) and said, "is that what I think it is?" But she already knew; we both instantly knew! 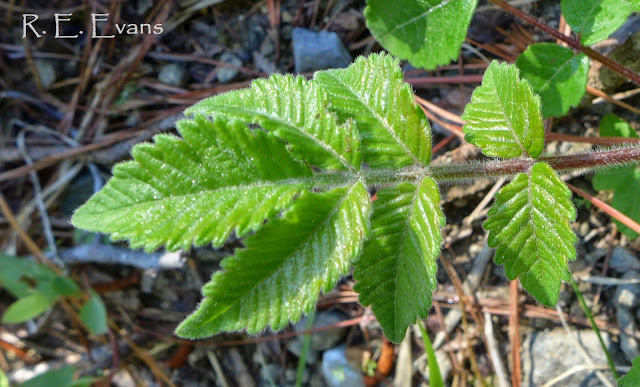 It's not every day one finds a new population of an endangered species, especially one of the rarest shrubs around. What made this such an unexpected surprise? No previous survey work had associated Michaux's Sumac with these particular soils, and we did not believe the species native to the county. Sure, there was a planted population elsewhere in the county but what did that mean? We had been frankly fixated on the other rare species present, namely Smooth Coneflower (Echinacea laevigata). Finally, the area had been literally "out of site and out of mind". Other than a single prescribed fire we conducted years ago, this area had received no management attention. The last time we burned nearby, the area was avoided and had been languishing ever since. Fortuitously, early in the year I made a brief visit to the area with Herb & Pat Amyx. We observed excellent restoration potential evidenced by numerous rosettes of Parthenium, and Helianthus atrorubens; we speculated on what might appear with appropriate restoration. Game on......and the hard work began. 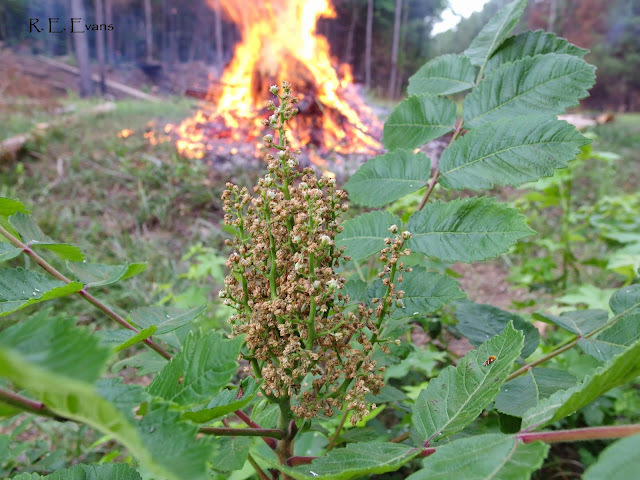 We got an answer to our earlier speculation this May when over 40 stems of Michaux's Sumac were found! An abandoned railroad track runs through the middle of the site. In preparation for a controlled burn woody vegetation was cleared around the RR line (which also served as the fire line). The dense, dark woods toward the back right remained uncleared but were included in the initial fire; this tree density was typical across the entire length of the tract. Fire scars are evident on boles of shortleaf pines from the prescribed burn & orange-brown vegetation (back left) was top-killed by a more recent prescribed burn. The brush pile is one of many created from hand clearing. During the prescribed fire, dense piles of pine needles and other leaves burned deeply exposing the RR ties underneath (we had stationed a pump unit there to wet the ties before they could ignite). All we really hoped for was flowering of the common species to benefit pollinators. Michaux's Sumac (Rhus michauxii) was listed as federally endangered in 1989. Although also endangered in North Carolina, the species is doing reasonably well in the sandhills region, where protected land and prescribed burning are relatively common. Populations in North Carolina's Piedmont have been all but wiped out. Loss of habitat to development and fire suppression are among the main culprits.